Panasonic Laptop Repair services are offered by Creative IT, an IT consultation and computer maintenance company based in the heart of London. We have clients from all over the UK and handle all the major brands of computers, laptops, notebooks, servers and more. Creative IT is one of the leading IT companies in London who specializes in same day PC, laptop and notebook repair, configuration and diagnostics. Panasonic laptop models CF-W2DW model series, Toughbook-eLite, Toughbook CF series like CF-27, CF-37, CF-48 and CF-50 are serviced and repaired by Creative IT. Our well qualified and highly experienced and qualified engineers and technicians are highly competent to even undertake board level repair. Broken or damaged components on the laptop motherboard like diodes, capacitors, transistors are removed and will be replaced by us. Other replacements can include LCD screens, floppy drives, CD-ROMs, keyboards, etc. Our Panasonic Laptop Repair Services include memory upgradation, data recovery and data transfer from failed / damaged hard disks. Hard disk upgradation and software installation on Panasonic notebook is also done by Creative IT. 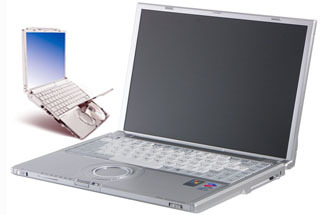 We also have in stock parts for all models of Panasonic laptops and notebooks. We offer affordable and quality Panasonic Toughbook repair services on all models down to component level, with quick turn around period. Being qualified IT professionals, our engineers have many years of experience and can repair major computer and notebook brands like IBM, Sony, Compaq, Dell, Apple, Packard Bell and HP. They also have rich experience in assembled computer system repair and service. At Creative IT, our relationships with customers are based on trust, professionalism and commitment to service. Panasonic Laptop Repair is done onsite or at our work station. Our turnaround time is a maximum of 2 days. Same day repair service is also available on a priority basis. Clients shipping laptops from other parts of UK first need to talk with our representatives over telephone regarding packing issues etc. All Panasonic Laptop Repair service charges are very competitive and parts replacements can be either new spare part from the manufacturer or from our inventory of used laptop spares as required by the client. We also have comprehensive maintenance contracts for Panasonic Laptops and Notebooks. For faster Panasonic Laptop Repair service, please call us at 020 7237 6805 and one of our Panasonic service representatives will help you determine the most cost effective way to repair your Panasonic Laptop.